Growers Network is a vetted community exclusively for commercial cannabis professionals, allowing members to connect, trade knowledge and transform the industry. We were thrilled when the network's community manager asked to feature TNTpr's Todd Nelson in the Growers Spotlight and talk about public relations in the cannabis industry. 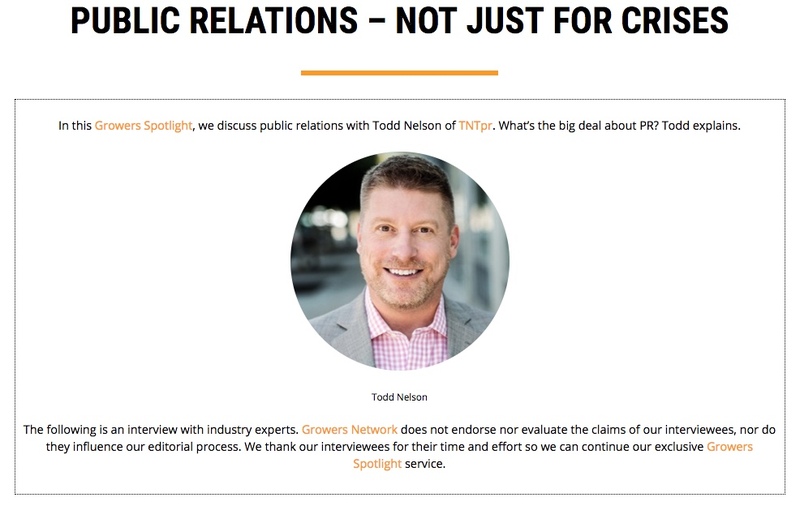 In this Growers Spotlight, Growers Network discusses cannabis public relations with Todd Nelson of TNTpr. In the interview, Todd shares how PR, media relations, marketing, marketing communications, advertising and brand strategy all are inherently part of any strategic marketing mix and are relevant to entrepreneurs and businesspeople in all industries, including cannabis. In addition to learning why and when a cannabis business should hire a PR firm, check out the feature and see why Todd got into cannabis, what have been his biggest successes (and challenges), and why he loves helping cannabis brands tell powerful stories.